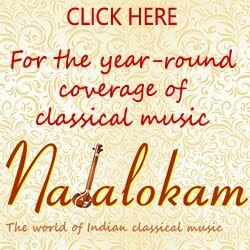 Bharatiya Vidya Bhavan, which is the first of the sabhas to launch the music season in the city is a favourite destination for many rasikas. 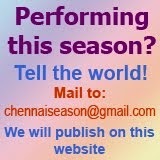 One reason is that the location is well-connected and has other interests like the Kapaleeswarar temple, traditional shopping and food joints. The other reason is that the concerts are not ticketed. 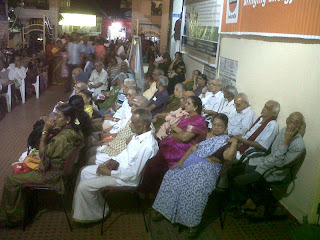 Today's concert by Sudha Ragunathan saw a houseful show and the rasikas flowing to the corridors in front of the CCTV. The chill weather in the open did not hold back the rasikas to the halls. Even many seniors were seen glued to the concert. 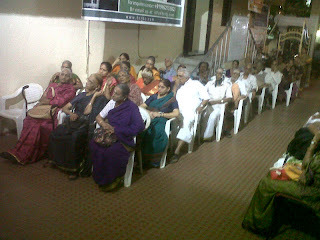 Aruna Sairam's concert on the other day also had similar overwhelming rasikas at this sabha.